The Department Store Yearbook provides insights into current trends across all product ranges sold within department stores, as well as looking at industry developments, from sourcing and buying, right through the supply chain, to retailing and store display. 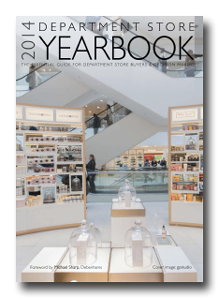 Department Store Yearbook is targeted to every buyer and senior executive at department stores throughout the UK, and our previous editorial contributors have included senior spokesmen from Debenhams, House of Fraser John Lewis, Fenwick, Beales and Marks & Spencer. The yearbook also provides a comprehensive directory of suppliers to aid all those involved in buying decisions, as well as a breakdown of industry events, news on the past year, and company and product profiles. We feature insights from successful industry leaders and aim to provide an all-inclusive source-book and reference guide for the next four seasons.